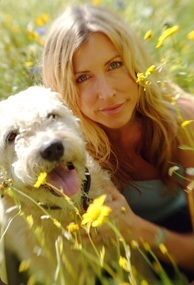 Heather Mills, anti-landmine activist, was presented with the 2004 Human Security Award on April 28th, 2004. Featuring a keynote address by Heather Mills, anti-landmine activist and recipient of the 2004 Human Security Award. Policymakers, activists and scholars gathered on Tuesday, April 28th for the Human Security Award ceremony at the University of California Irvine, presented by the UCI Center for Unconventional Security Affairs (CUSA). The ceremony, which featured a keynote address by anti-landmine activist Heather Mills, focused on the lessons learned and future policies in relation to the international movement to ban landmines. During the keynote address, CUSA presented Mills with their 2004 Human Security Award and formally announced the creation of the Heather Mills Fellowship in Human Security, designed to support UCI graduate students conducting research on pressing human security issues. "This topic is particularly salient given recent changes to the U.S. Landmine policy announced in March by the Bush Administration,"said Richard Matthew, associate professor of international and environmental politics and director of CUSA. He added, "Heather’s made a significant contribution. Her unrelenting and tireless work – counseling individuals victimized by landmines, meeting with world leaders and raising awareness over present and future policies and prevention – is something in which we can all take pride. "A United Nations Goodwill Ambassador and 1996 Nobel Peace Prize nominee, Heather Mills’ keynote speech "Clearing A Path To A Safer World" will include personal footage of her experiences with landmine survivors. Renowned as an anti-landmine activist and a Patron of Adopt-A-Minefield, Mills has been involved with the landmine issue for more than a decade. She has worn an artificial limb since 1993, and as a result, she became a strong advocate for the disabled. In 1994 she started shipping disused artificial limbs and medical equipment to Croatia. Since then her work has helped more then 366,000 people and through Adopt-A-Minefield Mills has been responsible for the clearance of nearly 8 million square meters of minefields. According to Matthew, around the world, some 60 million landmines deny people access to the land they need to survive. Humanitarian efforts to rehabilitate landmine survivors, restore mined land and ban the use of landmines contribute to human security. Matthew, whose research examines the root causes of political violence, is an editor of the book Landmines and Human Security: International Politics and War’s Hidden Legacy. His co-editors include Kenneth Rutherford, landmine survivor and co-founder of the Landmine Survivors Network, and Bryan McDonald, CUSA assistant director, who will also be presenting at the summit. Prefaces to the book are written by Mills McCartney and Sir Paul McCartney, Her Majesty Queen Noor of Jordan, U.S. Senator Patrick Leahy and the Honorable Lloyd Axworthy, president of the University of Winnipeg and former Canadian Parliament member. Her personal experience as an amputee and the positive manner in which she dealt with her recovery gives Heather a unique insight and affinity with those who themselves have lived through a tragic experience. Heather voluntarily counsels people from around the world who have lost limbs in accidents, through illness, natural disasters and terrorist atrocities. Her personal advice, determination and commitment help them and their families realise that they can continue to lead rich and fulfilling lives despite their injuries. It was in this spirit that Heather recently appeared on the Hit US Television show Dancing with the Stars proving this point in spectacular cart wheeling style. Heather was invited by legendary chat-show host Larry King to guest host two of his shows. "Larry King Live with Heather Mills and Paul Newman" was broadcast worldwide on CNN, April 17th 2004. Larry King was thrilled with Heather’s interview. Larry had found Paul Newman one of his most difficult guests to interview due to his humble and shy nature. Subsequently, following Heather’s amazing debut he asked her to cover the wedding of Prince Charles and Camilla Parker Bowles in place of him. She had to conduct live interviews with 5 people around the world in the same programme. The show was a total success. She is looking forward to doing more presenting in the future.